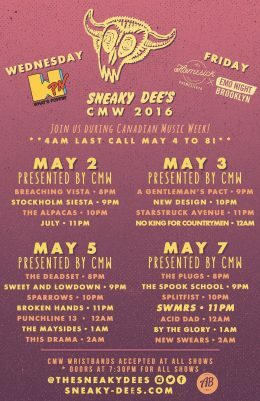 The 2016 edition of Canadian Music Week will soon be taking over Toronto and we’re once again stoked to host some of their grittier showcases. Planning some late night outings? Last call will be at 4AM from May 4th-8th!!! Just make sure you’ll be able to survive till the end of the week. We’ll see you soon for some late night tunes, drinks and nachos.